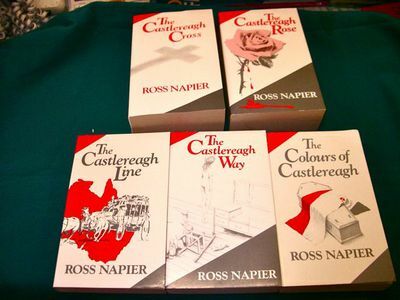 A really good Australian yarn to read is the Castlereagh Line saga by Ross Napier. It runs over 6 books and covers the start of the coach line services in the Castlereagh area of NSW in the 1880s. It mainly concerns the see-sawing fortunes of Lottie Clemens and John ("Jack") Seager and the romances and vicissitudes of Lottie contrast well with the dastardly deeds of Jack. It covers a wide area of Australia and then in a later book branches out into international travel when the company buys a travel ship called "The Castlereagh Rose". The books are a print version of a radio serial heard in the 1980s on Australian radio, and it is still repeated to this day. There are about 900 episodes that run for a few minutes and many people wake at 4.30 in the morning to hear the episodes broadcast on Melbourne radio. It is a well written series that gets you really involved with the characters and with plenty of cliff hangers to keep you wanting more. Murder, crime, family entanglements, illegal dealings and spicy romance keep both men and women reading to the very end. Worth reading if you enjoy Australian history in an entertaining form. These books can be very hard to find as they were printed in the 1980s and are mostly to be found on the Internet and in second hand bookshops, such as Rainy Day Books. Since this article on Weekend Notes, the Castlereagh Line is no longer available from Rainy Day Book of the Basin. Sold out! Why? A really good Australian yarn. Sounds like my Library should stock them on shelf. Fingers crossed try will after I put in request. Great series of books, I bought mine from Rainy Day Books in The Basin, Vic.